Since it's so close to Halloween, how about this for a Tue Temptation... Costumes! 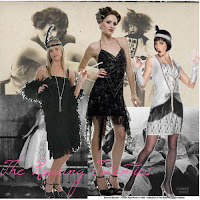 Or variations of the same one...The Flapper. I love these outfits...the beads, the boas and the bawdy attitude to boot! Maybe this year I should dress up in one of these little numbers and relive the roaring twenties...at least in my head that is! Oh,oh... I love dressing up as a flapper... I got to wear a red number once with the fringe. That was fun! I've always wanted to have a Flapper party. I love the flapper dress!!!!! It wasn't a costume, but my most favorite dress ever was flapper-style, hot pink fringed dress I had about 25 years ago. OMG I loved that dress. Sigh. Oooh Savanna, a glorious red with fringe...I'm turning green over here. It sounds wonderful!